The relationship between a company and its clients is a precious one. If that relationship isn’t solid and personable, a company can’t thrive. Obviously, without satisfied customers what else is there? That precious relationship is built from the very first interaction and continues through every follow-up exchange. In a way that first interaction is the most important one. It provides a face for the company, an invitation and expectation for things to come, setting the standard for what the customer can expect. That’s why when DIRECTV chose Smart Circle International to work with them in client acquisitions, essentially acting as a face for DIRECTV, it was such an honor. With data showing compound annual growth in DIRECTV subscriptions exceeding 10% over the last three years of its partnership with Smart Circle International, it certainly is a smiling face! 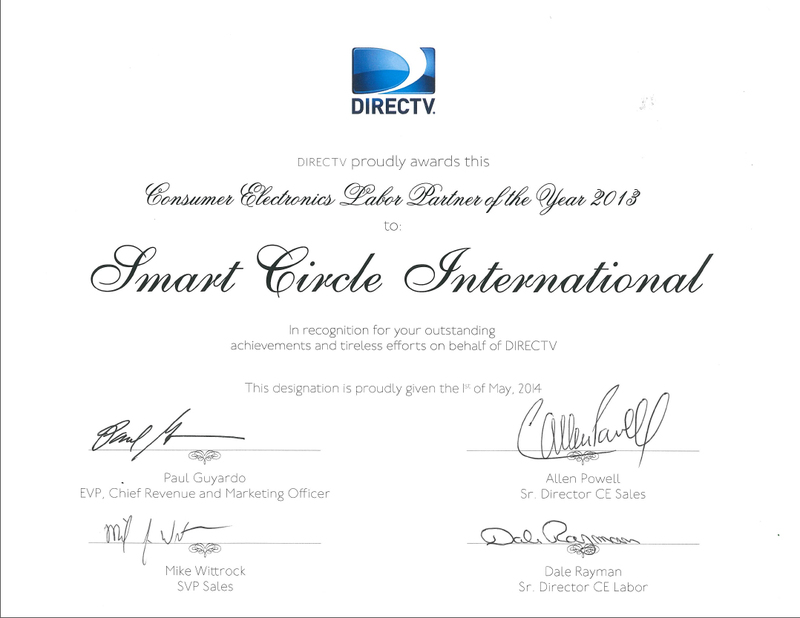 DIRECTV honored Smart Circle International once again by naming them 2013 Consumer Electronics Labor Partner of the Year. “This accomplishment is a direct result of not only the sales network and robust installations, but also the hard work and dedication of the Smart Circle employees that support the entire program. Thanks to the business development, operations, finance and compliance teams,” says Smart Circle International CEO Michael Meryash. Kudos and congrats to everyone working on the DIRECTV program — keep up the good work! !